“Fighting rages. Sectarian hatred is on the rise. The catalogue of war crimes is mounting. Sexual violence is widespread,” said United Nations Secretary-General Ban Ki-moon, speaking of the conflict in Syria in an address to a major United States think tank on Monday. 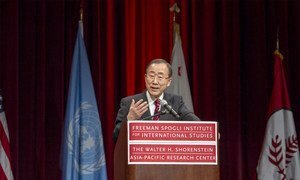 In his remarks, Ban Ki-moon highlighted Syria and climate change as two major issues that threatened huge, global consequences and called for the international community to uphold its responsibilities in facing them. “In both cases, the international community is not upholding its responsibilities,” Mr. Ban told the Council on Foreign Relations as he delivered the Sorensen Distinguished Lecture of that group, in an event moderated by news anchor Christiane Amanpour. “Both risk the harsh judgement of history should present trends continue. And both require collective action that must involve the United States,” Mr. Ban said in the talk, during which he announced plans to visit Washington D.C. later this week for talks with Secretary of State John Kerry and other government officials. “Syria is self-destructing,” he said of the nearly two-year old conflict between President Bashar al-Assad and its opposition, which has left more than 60,000 people, mostly civilians, dead and more than four million people in need of humanitarian assistance. Turning next to what he called “the gathering threat of climate change,” he noted that scientists have long sounded the alarm on what he called the gathering threat,” stressing that the potential consequences were well known, including “a downward global spiral of extreme weather and disaster,” along with development reversals, increased displacement, aggravated tensions over resources and destabilization of fragile states. “It is time to move beyond spending enormous sums addressing the damage, and to make the investments that will repay themselves many times over,” he said, noting the potential of the renewable industry to do that and to spur the world economy, as proposed in his Sustainable Energy for All initiative. “A global climate change agreement would give us the engine we need to advance us decisively on this path,” he stressed, welcoming US President Barack Obama’s “new resolve” to address climate change and give it high political priority. “We need national leaders who think globally. We need a stronger sense of collective responsibility. And we need the United States,” he said.